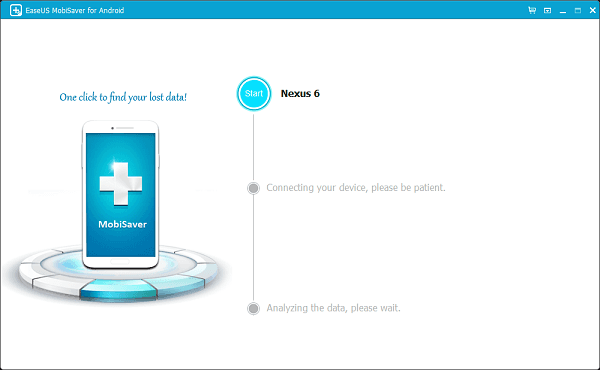 EaseUS Mobisaver for Android review: An all-in-one data recovery software - Playfuldroid! Have you ever suffered from a panic attack after you have accidentally deleted your files or folders, or lost your critical data due to virus or malware attacks? If yes, you are definitely not alone and we do know exactly how horrible it felt. This is why we are here to present you our review on EaseUS Mobisaver for Android, your all-in-one tool to recover all your lost data! Magical as it sounds, this tool is capable of recovering your data which were lost due to accidental deletion, virus attacks, rooting, improper handling, SD card issue and many more. First and foremost, we will answer you the most important question, “Does EaseUS Mobisaver for Android supports all Android smartphone?“. The answer is yes, as long as your device is produced by Google, Huawei, HTC, LG, Motorola, Samsung, Sony or ZTE. Even if your device isn’t manufactured by any of the aforementioned smartphone maker, fret not, it will most likely be supported as well. Just head down to their support page and verify with the sales team and you are good to go! Next, we will talk about the file formats which are supported by EaseUS Mobisaver for Android. If you had ever used a data recovery software before, you may have realize that there are some file formats which the data recovery software is not able to recover. However, this will no longer be an issue if your are using the Mobisaver tool. No matter what file types you have, this tool will probably be able to resurrect them for you. What’s even better is that the tool allows you to preview the data before you decide whether you wish to restore them! To those who ain’t an IT savvy, data recovery will definitely sounds like a traumatizing task for them. Imagine all those complicated steps you have to go through, typing alien commands which doesn’t make sense at all just to recover back a single file from the memory dump. Such a nightmare isn’t it? This is absolutely the reason why we have EaseUS Mobisaver for Android! With it’s simplistic user interface, anyone from all walks of life with or without any technical knowledge will be able to easily recover their lost data in just 3 simple steps. In the step-by-step guide below, we will show you how this can be done. However, before we begin, do note that your device must first be rooted before you carrying out the recovery process. This is a standard requirement across all the data recovery software. The first step you need to do is to download the EaseUS Mobisaver for Android tool from the official website here (free version) or here (premium version). After that, run the package installer and install the software on your desktop/ laptop. Next, connect your Android device to your desktop/ laptop using the accompanying USB cable. 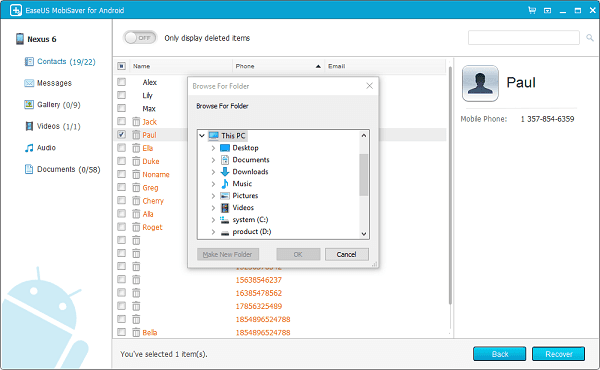 Wait patiently while the tool analyzes both your internal and external storage drives to discover all the deleted data. After it has discovered all the data which you have deleted, you will then be able to select which of the data you wish to restore. Once you have selected, you will click on the ‘Restore’ button and it will ask you to specify the folders where you wish to restore the data to. Congratulations, you have successfully recovered all your lost data! 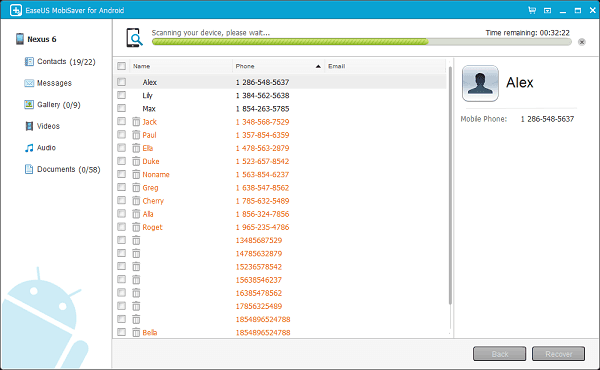 This is how simple it is to recover your lost data with EaseUS Mobisaver for Android. If you’re interested, you can first test out the free version (with limited features) here. If you’re impressed with this tool, you can choose to purchase the full version here at a price of just US$19.97 after a 50% discount. This is a limited time offer, so grab it fast before you miss it! With EaseUS Mobisaver for Android, data recovery has become a breeze.